Whimsicott is a small bipedal Pokémon that resembles a ball of cotton. Its body is brown, and its back, neck, and forehead are covered with a puffy white cotton-like substance. On its back is a green, star shaped pattern that resembles the area where a plant connects to its fruit. It has large ovular orange eyes, an grinning face, and green, curled horn-like appendages that seem to be its ears. Whimsicott can ride whirlwinds and drift along in the air. It is able to slip through very narrow gaps, it uses this ability to sneak into houses and pull pranks such as moving furniture and leaving behind cotton balls. 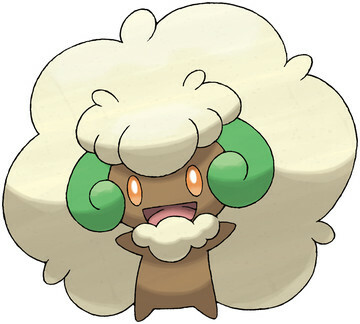 -Although Whimsicott is the Windveiled Pokémon, it is not a Grass/Flying Pokémon like Hoppip, Skiploom and Jumpluff. -Whimsicott and its pre-evolution were originally pure Grass-types, but were changed to duel-type Grass/Fairy Pokémon when the new Fairy-type was introduced to the games in Generation VI. -The new fairy typing makes it the only Pokemon up to date to receive a 4x weakness to poison. -Also the only Pokemon to have grass/fairy typing. -Whimsicott is the fastest Prankster Pokemon. -This Pokémon is the April on the Pokémon Horoscope. Infiltrator - the wielder bypasses the foe's Light Screen, Reflect, Mist, Safeguard, and Substitute. Like the majority of fairy types, Whimsicott is inferior to Scrafty, err, I mean, Whimsicott best serves as defensive support. Especially with the ability Prankster, that alone spelled trouble. Furthermore, a lot of Whimsicott's moves are Status Attacks, which take advantage of a priority boost thanks to its Prankster Ability. However, this could be countered by faster Pokémon with the same Ability that uses Taunt, though Whimsicott is the fastest Prankster Pokemon, but still, a Pokémon that has the Magic Guard Ability ruins the majority of its sets, if not all, not to mention Taunt passes through Substitute. Additionally, Whimsicott can't take too many hits due to relatively low HP... Thus, rendering the pokemon in RU, but, god this thing is so versatile when it comes to VGC, needless to say... Whimsicott is astonishingly fun to play with, gives Pokemon that little troll touch that causes the lovely lolz. Thanks to Sun Stone, Cottonee can evolve at level one. Whimsicott is the fastest Pokemon on the field once it gets up Trick Room. Endeavor will bring enemy Pokemon's HP down to an extremely low number. This means that a teammate can easily pick off weakened opponents. Encore still has a priority of +1 and helps tremendously against Pokemon that use Fake Out, Tailwind, and Protect. The best partner for this set is Scrafty. The lizard with pants gets Fake Out to help set up Trick Room. Scrafty also functions quite well in Trick Room, and quickly racks up Attack boosts (thanks to Moxie) with the help of Endeavor. Carracosta is another good partner. It can protect both Pokemon from spread attacks with Wide Guard, has a low base Speed, and a great ability that acts as a Focus Sash. The more I dig around, the more I am falling in love with this little piece of sugar, I think I'll run this set since Aurath gave me one of this monsters with Switcheroo. Now, the set looks pretty self explanatory: ruin opposing Pokemon's day. Firstly, the Lagging Tail, this item will not only rid you of the opponent's most threatening sweeper but will also run in conjunction (if Switcheroo has not been used) with one of my all time favorite moves, U-Turn, as you can guarantee a safe switch in for one of your team mates, and you better believe Whimsicott will force a swich. Worse case scenario, you have Memento which will more than surely force a switch, at a price, but will give a free turn for a sweeper, enough to change the entire game. As for Encore, it's a pretty standard bread and butter on Whimsy since BW. Taunt is also a choice, could replace Switcheroo and Lagging Tail for Leftovers. Okay, I'm done, this little candy wannabe ball is making me sore and there are so many more roles for it! Oh, hey, there, uh, you, surely you'd like to tell us what set you would run! Go on, now, don't be shy, post below.